The Mango Bride is featured front and center in the first display case. 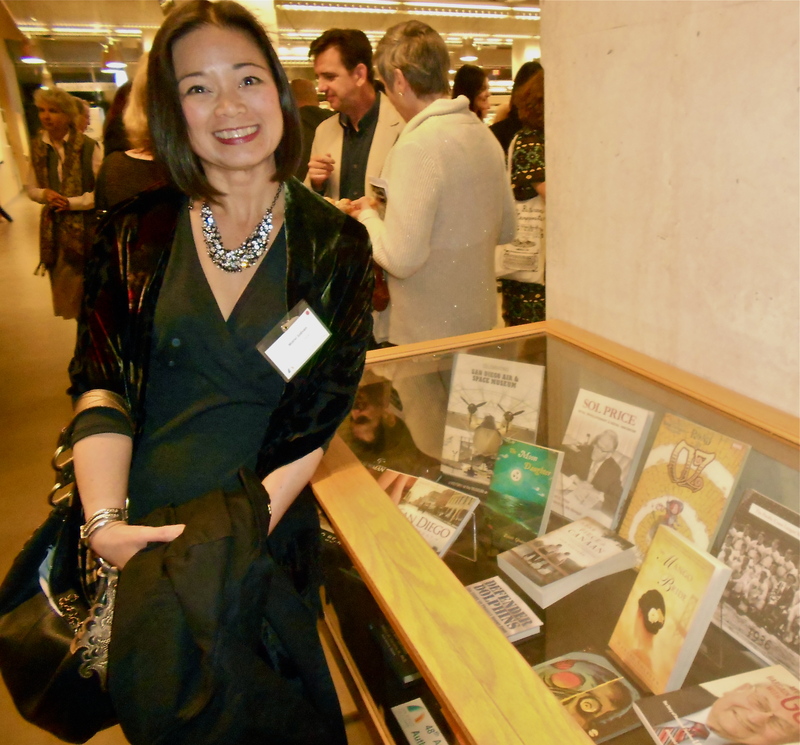 The Local Authors Exhibition at the new San Diego Public Library opened last night with a private reception for authors who had published a book in 2013. There were 385 of us on the list, everyone from self-published authors to authors of digital editions and traditional books. Mel Katz, Chair of the San Diego Public Library Foundation came onstage to welcome us to the event and describe the 30 year long process of planning, fundraising and building this magnificent new library. The library may have taken three decades to come together, but looking at the beautiful first floor auditorium, flanked on one side by wall-sized art installation of open books and on the other end with gleaming bent wood panels, everyone knew it was worth the wait. Since the library opened last summer, the number of visitors has quadrupled, from an average of 800 people at the old location to 3,200 every day at this new facility. Each of its nine floors offers delights for readers of all stripes: rare books, periodicals, children’s books, a gaming room for adolescents, even a charter high school, which now serves a freshman class of 500 students. I knew only two other writers at this event – Zoe Ghahremani, (author of The Moon Daughter) and Sandra Younger (The Fire outside My Window). The flu kept Sandra from joining us last night and we lost sight of Zoe in the crush of people crowding the buffet table after the short program, so my husband and I wandered around the exhibit, looking at the vast array of books arranged like fine art in glass cases. We stood in the buffet line for a good half hour until hunger got the best of us. Giving up on the quest for free hors d’oeuvres and unable to find the bar, we decided to leave early. On our way out we ran into Marc Chery, the library’s Director of Programming. I had given Marc a copy of The Mango Bride a week earlier and was surprised to hear that he’d somehow found the time to read it. “Wow. That’s got to be one of the best opening lines I’ve ever read — it really grabs you.” He clutched his neck, mugging for effect.”It’s just as good as that other novel, you know, the one that began with Colonel Aureliano Buendia …” Marc paused, mentally riffling through memories of other books. “Where he’s standing in front of a firing squad?” My husband offered. “Yes! Colonel Aureliano Buendia is about to be executed, but then he remembers the first time his father showed him ice! That novel. Your opening is as good as that other one’s first scene.” Marc beamed. Really? You think The Mango Bride is on the level of A Hundred Years of Solitude? No need for food or wine after hearing that. One kind librarian’s words had already filled my heart to overflowing. I am genuinely delighted to read this web site posts which contains lots of useful data, thanks for providing such information.